It's time to let your dog support their favorite NCAA Teams. If your dog is more girly and doesn't want to wear a team jersey then the NCAA Team Cheerleading Dresses should work great. These cheer dresses for dogs are screen printed with the team name and have a velcro closure for ease of use. Now everyone in the family can join the fun, wear the team colors and support their favorite team. Get your dog ready cheer for the team on game day! NCAA Alabama Crimson Tide cheerleader dog dress ..
Now your dog can cheer for her favorite team in the Arkansa Razobacks Cheer Dress for Dogs. This ch..
Is your little girl a cheerleader? Now she can cheer for the Auburn Tigers in the NCAA cheerleader ..
Is your dog ready to cheer for your favorite team? She will be in this NCAA Clemson Tigers cheerlea..
Don't leave your dog out of the fun on game day. Get her a Florida Gators NCAA cheerleader dog dres..
Get your dog ready to cheer for her favorite team! This Florida State Seminoles NCAA cheerleader do..
Get a Georgia Bulldogs collegiate NCAA cheerleader dress for your dog! This great dog cheer dress co.. Doesn't your dog like to take part in family fun, too? She will look great in the Illinois Fighting.. Your dog enjoys cheering for her favorite team, too. She needs an Indiana Hoosiers Cheer Dress for ..
Every one likes game day including your dog. Why don't you get her an NCAA cheerleader dog dress wi..
Let your special pup cheer for the home team in this lovely NCAA cheerleader dog dress with screen p..
Everyone in the family should be able to show their support for their favorite team. Now your dog c.. 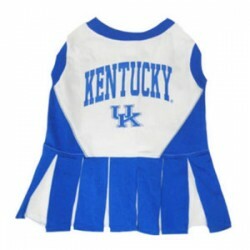 Your little cheerleader will be the hit of game day in this NCAA cheerleader dog dress with the Kent..
Make the other dogs jealous on game day when your little girl is wearing this NCAA Louisville Cardin..
Now the whole family can show their support on game day even the family dog. This LSU Tigers cheerl.. This NCAA cheerleading dog dress is screen printed with the NCAA Michigan State Spartans team logo a.. Looking for the perfect game day sports apparel for your little girl? Look no further! This Michig..
Now your dog can join in the fun on game day, too, in this Mississippi State Bulldogs cheerleading d..
Get the NCAA Missouri Tigers cheerleader dog dress with a screen printed NCAA team logo and velcro c..